Rope—all types of rope—offers a nautical, rural, rustic charm that makes us want to use it in our homes in less obvious ways. It is an inexpensive material to buy, and its versatile nature really lends itself to some truly incredible and inspiring DIY projects. It’s time to think outside of the box, ladies, and bring this not only into your home décor, but also into your wardrobe! 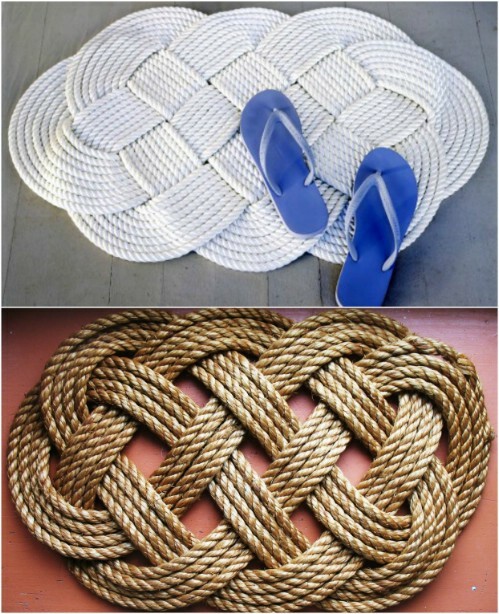 If you really love the braided rope look, you could do it on a much larger scale as a doormat or a rug. 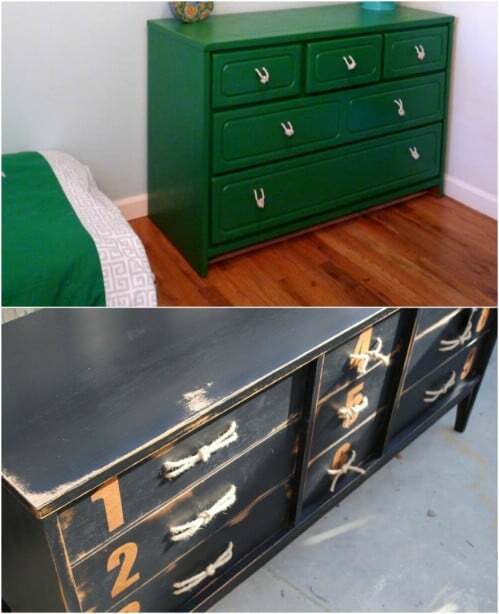 The result is an incredible modern, nautical-themed statement piece. 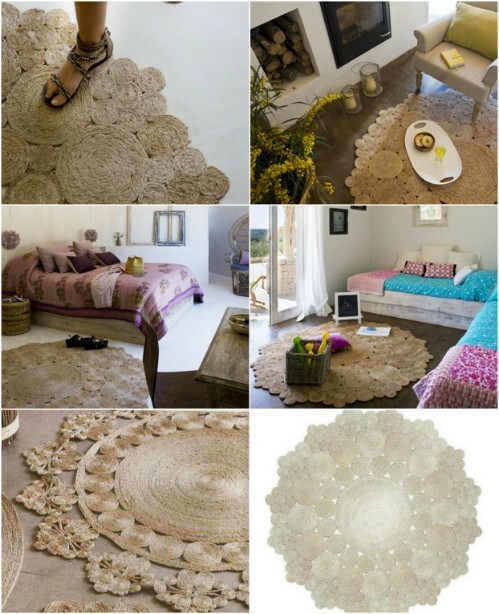 Here’s another rope-tastic idea for a rug made of jute or sisal. The basic concept is really simple, and the great thing about that is that you can really put your own creativity to the test to create a variety of designs. Gluing the rope swirls may seem like the easiest option, but if you’re looking for longevity, sewing them is a much better idea. 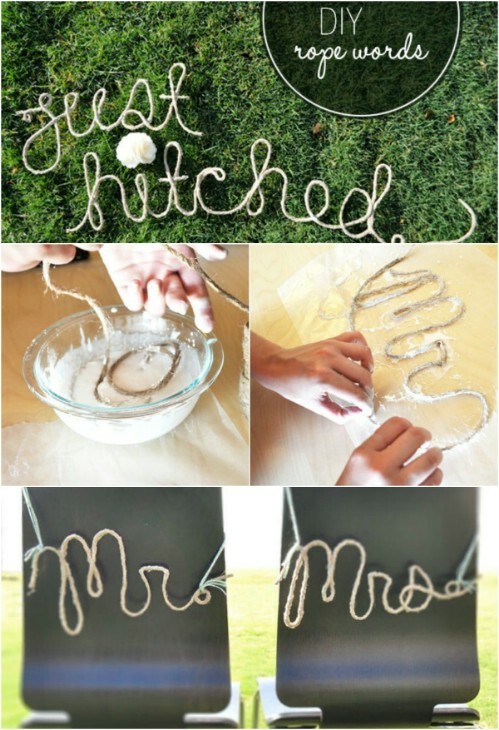 This is a really cute and fun way to spell out some special words, whether it’s for a specific occasion or purely a decorative addition to your home. You just need school glue, corn starch and water to harden and set the rope as you want it. You can even add some food coloring for an extra bit of pop. 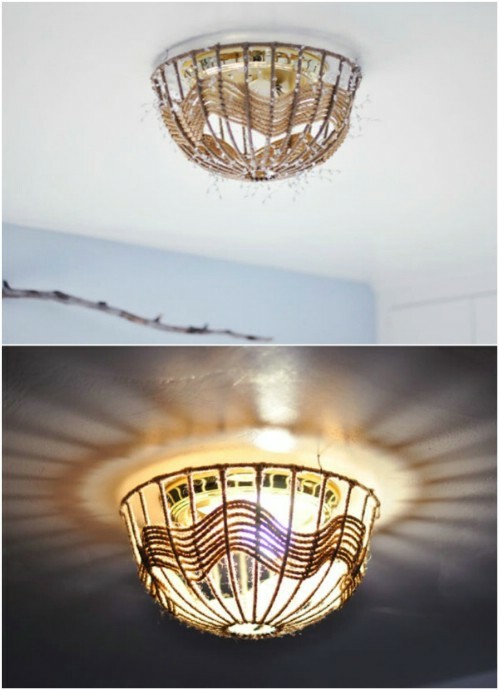 Replace an ugly, outdated light cover by wrapping a hanging wire plant basket in rope and then weaving some strands through it for a pretty design. It’s modern, interesting, and no one will have one like it! Just make sure to use eco-friendly cool bulbs. 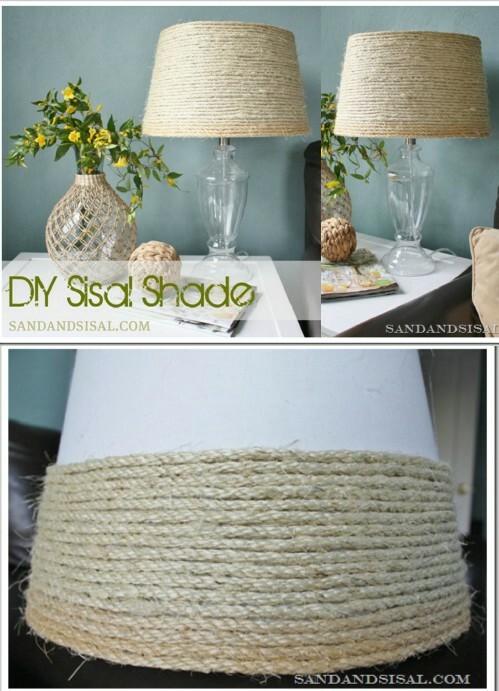 Disguising a tattered old lampshade on a tight budget is as easy as wrapping some rope around it. You can even dye the rope if you want to introduce some color, but the neutral and earthy tone of sisal rope will match just about anything. 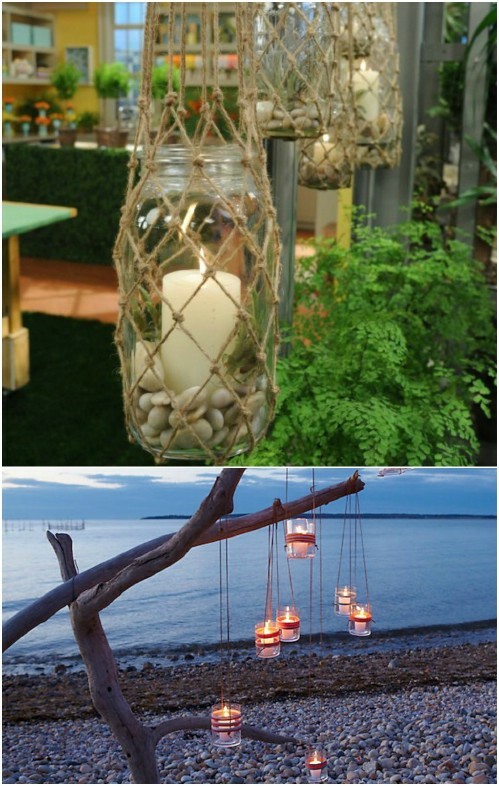 These hanging lanterns look great both indoors and outdoors; they add a real element of raw, homely charm to your home. The tutorial has a detailed diagram to help you with the lanyard knots so it really is a simple project to complete. Who knew that something as quick and easy as coiling a thick rope on itself could produce something so beautiful. If you can’t find cotton rope you can use nylon instead; you’ll just have to use a hot glue gun throughout the coiling instead of the Tacky glue. 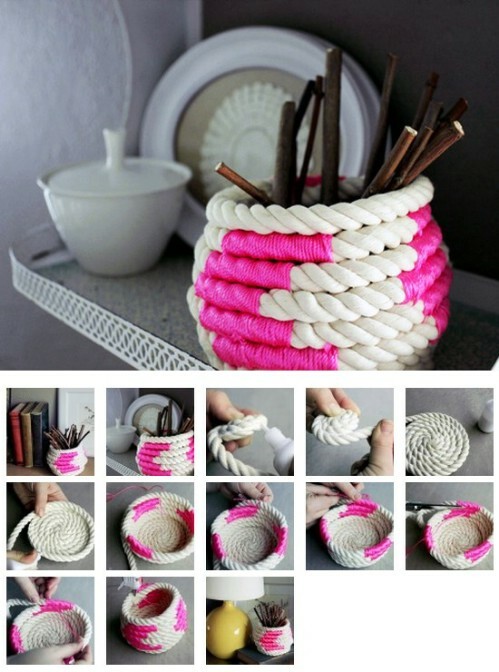 This is one of our absolute favorite rope ideas ever! You can spice up an old pair of shoes, or specifically go out and buy an inexpensive pair just for this. Just make sure you get the shoe and rope colors to match. These ankle straps can even double up as bracelets when not attached to your heels! 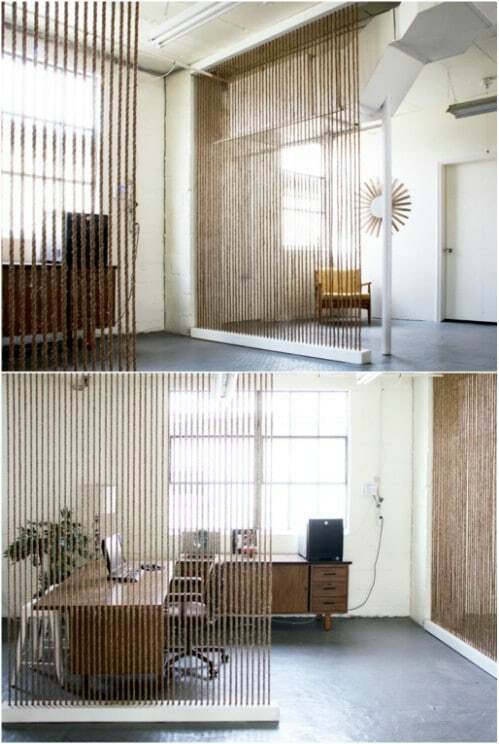 This rope wall is the perfect solution for people who need to divide a small room without making the area feel too closed off or boxy. The construction may take up a good chunk of your time, but the end result is a gorgeous, cost-effective space saver. This genius project really blends art with functionality. 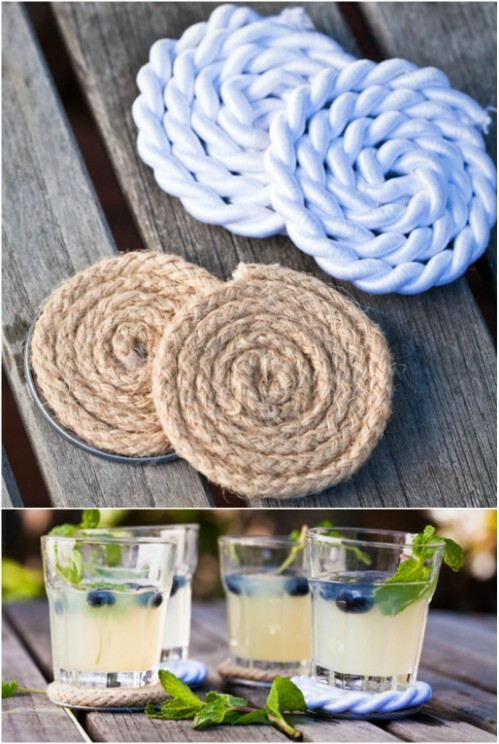 All you need to make these rustic coasters are can lids (or a Mason jar lids), rope, a hot glue gun, and about 10 minutes of your time. These easy and cheap coasters would make a perfect addition to any beach house. 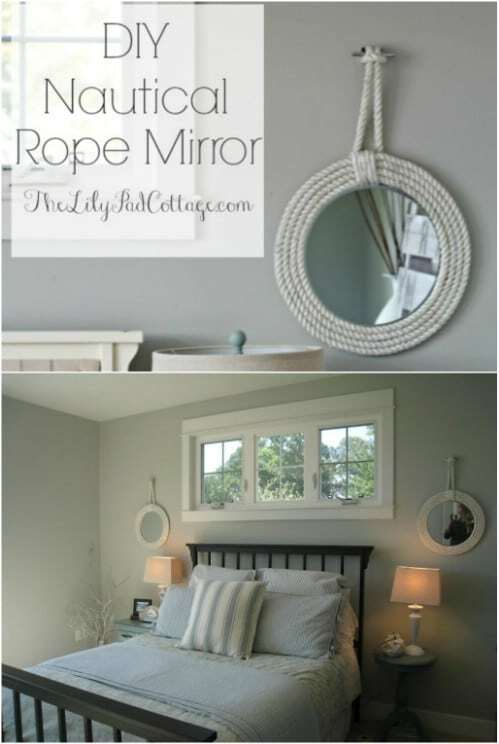 Another fantastic beach house decoration piece is this rope-framed mirror. All you need is some foam board as a base to frame the mirror so that you can glue the rope to that. This concept could also work fabulously with a clock or even a picture frame. 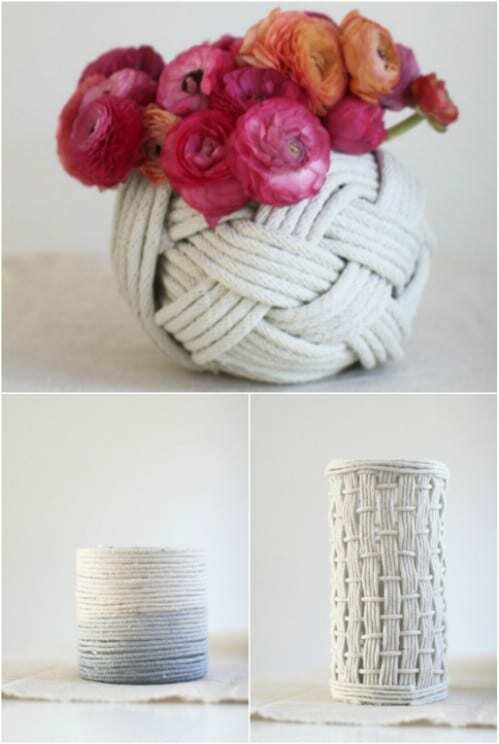 If you’re tired of your old, boring vases, you can give them some new life by simply wrapping them in rope. The sketches show you exactly how to braid, weave, and color the rope so that it looks like you got it at a crafty boutique. 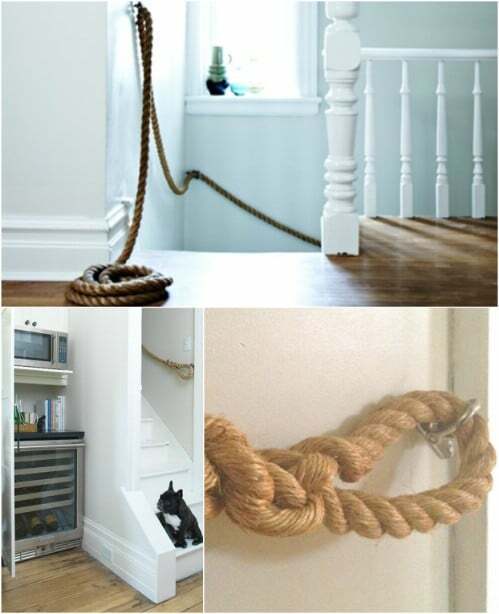 Using thick rope as an alternative to railings alongside stairs result in affordable chic design. Make sure you get the right sized shackles; the rope should just barely fit though so that it won’t get pulled around and slackened when you place your weight on it. 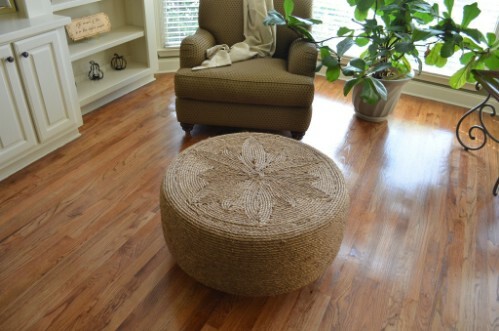 Looking for a new ottoman but can’t find anything affordable that’s to your taste? Why not wrap some rope around an old tire and make your own? It’s just a tiny bit more complicated than that, but once it’s finished and being admired, no one will believe you actually made it yourself. 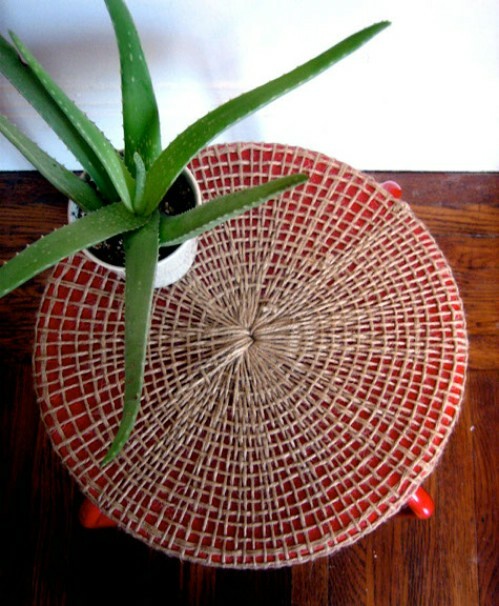 Transform a boring, plain old stool into a stylish and quirky side table (it won’t be too comfortable to sit on once it’s done) with some simple rope or twine. Simply put, you loop the rope from the center hole to the outside of the stool’s diameter, then take a separate strand of rope and weave in over and under the previous strands. And there you have it! 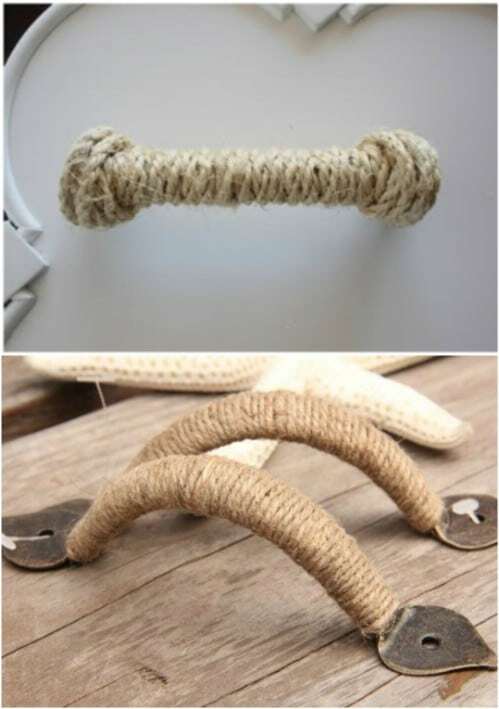 Drawer handles can be expensive to replace, so if you want something edgy, fresh and affordable, use rope! You can easily loop the rope through the screw holes and then tie a knot; if you have any sailor or navy friends perhaps they can help you play around with cool knot ideas. If you don’t want to fully replace handles, you can embellish them in the easiest way possible: wrap them in rope! If you want something a bit more exciting than neutral, mix different colors of rope or dye it to get the exact shade you desire. 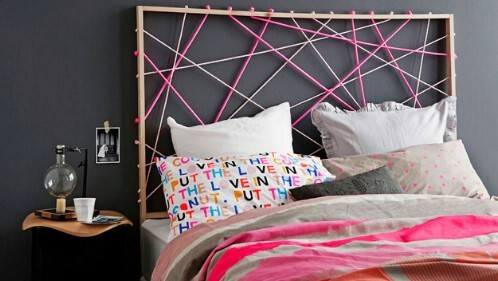 This ropey headboard resembles a large dream catcher; so not only will it look pretty, but it’ll give you pleasant dreams as well! You can play around and do your own thing in terms of color palettes and how you thread the rope (random or in an ordered shape). 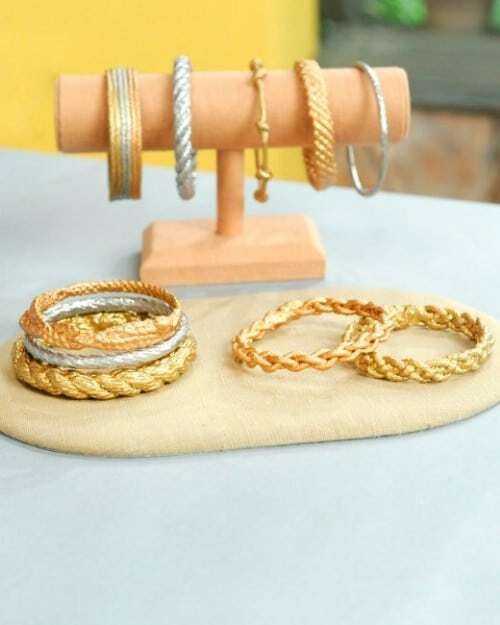 You don’t have to be a jeweler to make beautiful silver or gold jewelry, and you also don’t have to fork out a lot of cash; we have a sneaky, creative trick. You can knot or braid pieces of rope, dip them in fabric stiffener, and then paint them whatever color you want for a stunning homemade, unique adornment. Remember those friendship bracelets you used to make back when you didn’t have a care in the world? These multicolored necklaces will really have you reminiscing about your childhood summer camp days; it just shows that some things really never do go out of style. You could even introduce this old tradition to your own daughters. 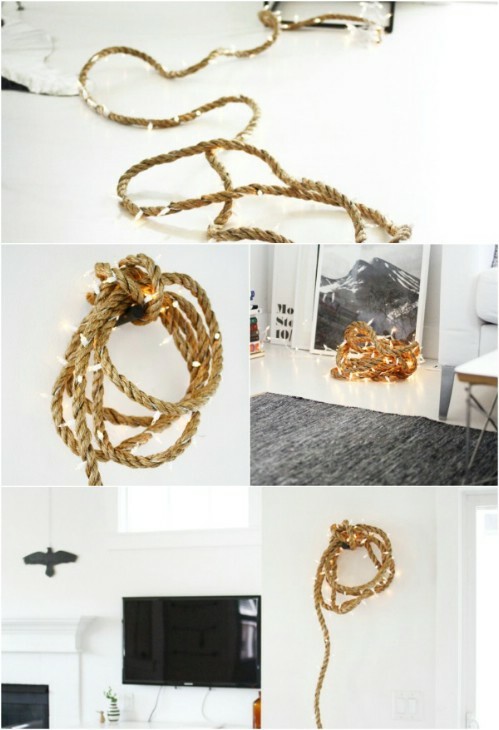 Threading a string of fairy lights through a piece of rope is an extremely easy way to make an eye-catching light feature. 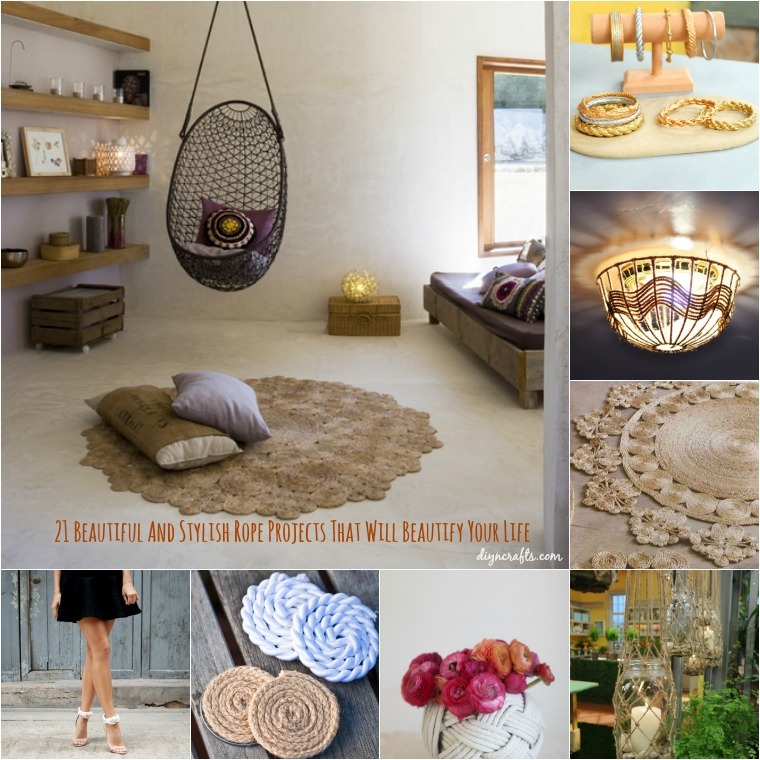 You can tie the finished rope light in a knot and hang it up or simply drape it over your mantelpiece or bookshelf; you can also use an array of different types of rope (thickness, material and color shade) to create a much larger feature. Dream Catchers are so beautiful and so peaceful. Even if you don’t believe in the actual reason that they exist, you are certain to love the look of them. 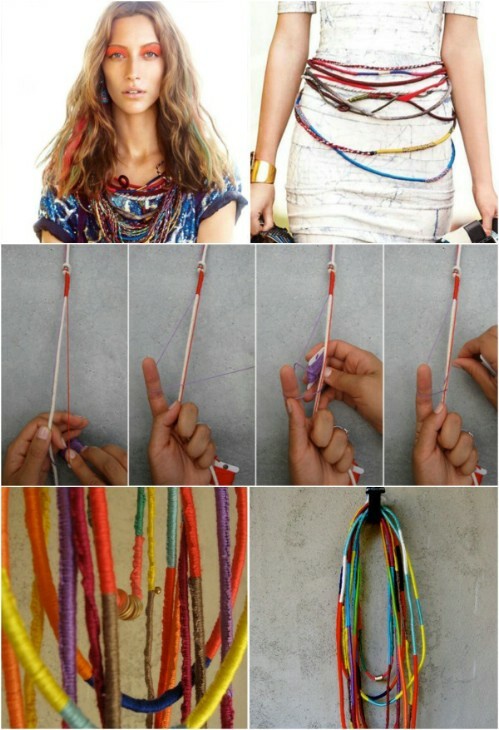 LuLu’s Blog has a great tutorial for making your own dream catchers. You just need a few basic ingredients – the list is on the site – and you can make these adorable heart shaped dream catchers that are easy to make and beautiful to display. Hang them on the rear-view mirror of your car or in your bedroom window. You can also make them as gifts to give away if you want. 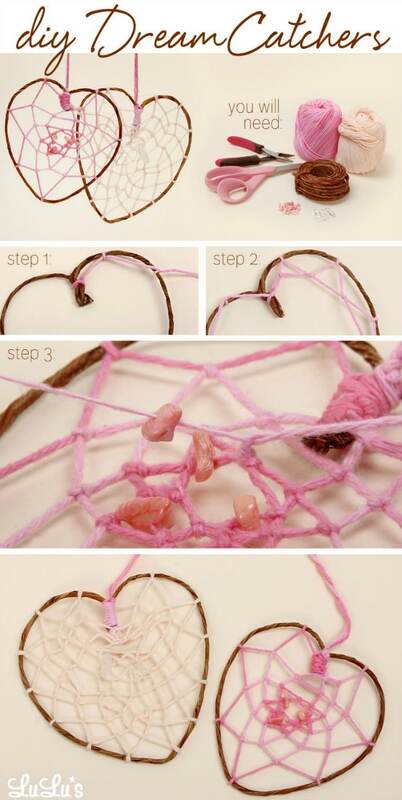 Everyone loves a dream catcher so be sure to make several. Check out erinropw.com for great prices on rope! All creative ideas! Love the lamp shades. Thanks for posting.